So what do you do when your day care lady calls and says that she is sick as a dog? You go to Plan B. Funny thing is I think I’ve actually already been at Plan B for the last week and now I may be somewhere around plan S. As in S is for sidewalk chalk! After a couple of rough days yesterday I greeted the knowledge that I would not be going into work, with the realization that the reason the last couple of days were made much worse was that I had lost my ability to play. Ultimately what that meant was that I was not enjoying being a parent the way I wanted to, and getting to experience the way that makes my interactions with my son compassionate, patient, enjoyable and fun. As we walked out of daycare the sun was shining, and even though it was cold, I took it as a good omen that today was going to better. I made the commitment to just focus on my son and off we went to the library. With only one Ginger meltdown on the bus and one at the library, it turned out to be a pretty good move. 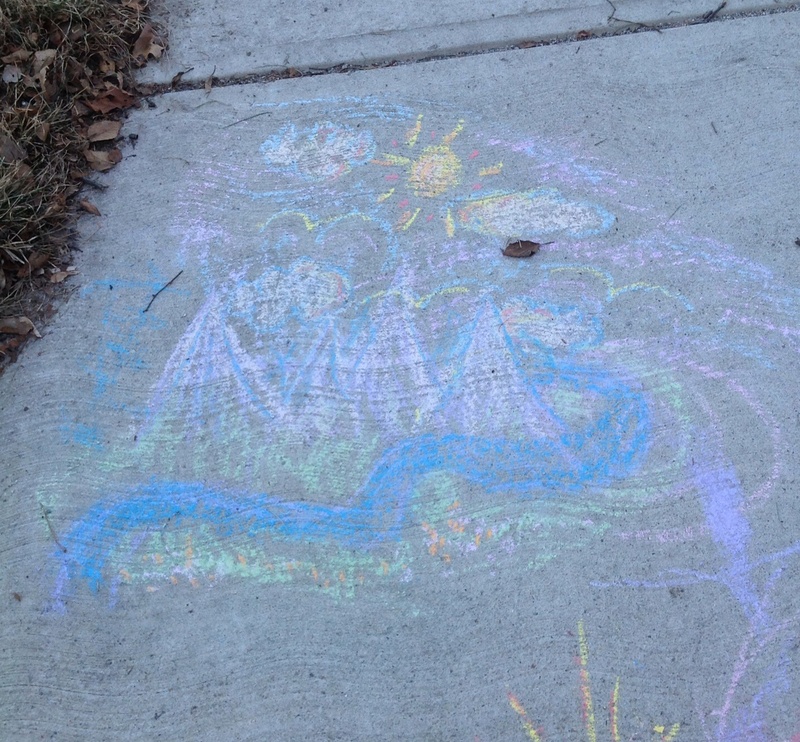 We walked home, and as we did I saw the sunny light had turned the day warm and the season for sidewalk chalk was upon us. After I took down the Christmas decorations and unsuccessfully tried to chip a string of lights out of the puddle of ice, I surrendered to plan S.
I was then informed that I had to be killed no less than three times before the fight was actually over. Once the allotted three times expired he fed me to the alligator, poked a couple holes in me, and then froze my head. Then he told me he “never wanted to see me in Neverland again”, which is even more adorable because he can’t pronounce the V yet and says it like a b. Yeah say it to yourself. So here we are taking one day as it comes, and trying to be forgiving with myself and with him. Sometimes it’s a struggle, but I have to remember that if I’m not having any fun, then it’s a pretty good bet neither is he. P.S. It’s also difficult to type when you have only one hand and one hook, but I have made the commitment.